Map, 23” x 18”, 2’ paper loss on lower right, about good. “Chart 4 1/2. 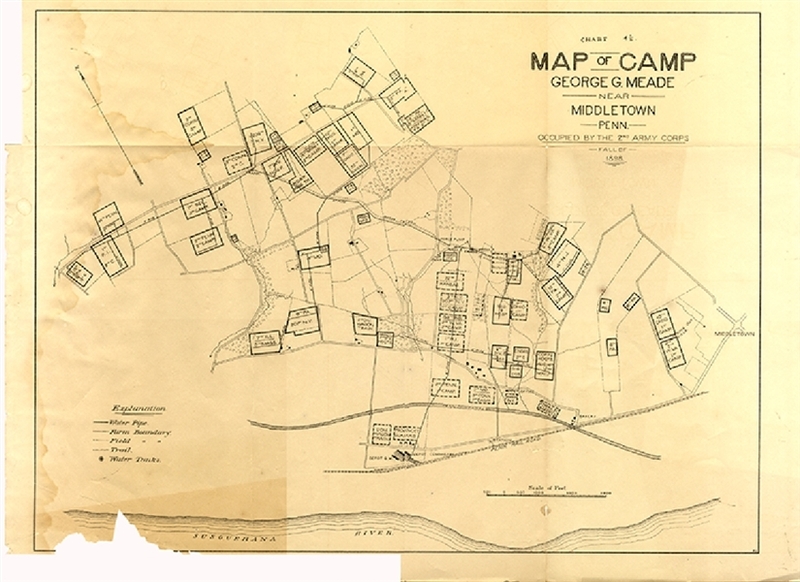 Map of Camp George G. Meade near Middletown, Penn. occupied by the 2nd Army Corps fall of 1898.” Camp Meade was established August 24, 1898 and soon thereafter was occupied by the Second Army Corps, of about 22,000 men under command of Maj. Gen. William M. Graham, which had been moved from Camp Alger in an attempt to outrun the typhoid fever epidemic. Camp Meade was visited by President William McKinley on August 27, 1898.